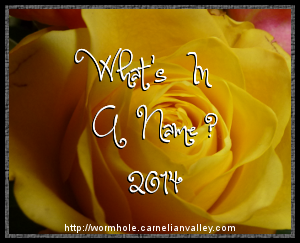 I’ve officially completed the 2014 What’s in a Name challenge, hosted this year by The Worm Hole! I enjoyed almost every book I read for this challenge…I don’t even think I can pick a clear favorite. But The Beauty Chorus was definitely my least favorite! So this was a fun challenge for me, and while I probably won’t be doing it next year (I’m really cutting back on challenges in 2015! ), I definitely recommend it to anyone who wants to get a little creative about choosing books!